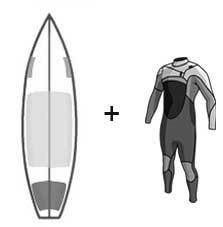 All our courses and surfing lessons include the necessary surfing and paddleboard equipment. If you want to surf on your own and don’t have the gear, we can supply everything you need: surfboards and paddleboards of various types, neoprene suits of all sizes, paddles and other accessories. You can rent surfing equipment by the hour. Although we have a considerable stock we recommend you book what you need in advance to avoid disappointment. For your own and other people’s safety, if you do not already have this knowledge we recommend you enrol on our surfing course for beginners. You must show your ID card or similar identifying document and leave a deposit. The person who rents the equipment is responsible for returning it in undamaged condition. Therefore, the customer is liable for any possible repairs. The late return of rented equipment will be charged separately . No surfing or paddleboard equipment will be rented out if sea conditions are not suitable. To rent surf equipment please visit us in Barcelona or Castelldefels during our opening hours and we'll be glad to help. Please bear in mind that we do not take reservations.